Following my introduction to the Airwheel, I’m now going to review the Airwheel Q3. If your wondering what on Earth this Air-thingamajig is and would like a bit of background, please check out my previous post. I have owned an Airwheel Q3 for nearly 6 weeks now. I’ve ridden it in many places both in the day and at night, and I’ve covered over 100 miles on it so far. As this is quite an extensive review, I have divided it into sections to make it easier to navigate. To jump to a particular section of the review, please click on a link below. How easy is the Q3 to ride? Where you can use the Q3? What you can use the Q3 for? Is it lazy to ride an Airwheel? How quickly you become competent at riding an Airwheel really depends on how quickly you learn. Of all the standard Airwheel models, I’ve found the Q3 the easiest to learn. This is largely down the the fact that it has two tyres which offers additional balance. It took me around 30 minutes before I could confidently ride around on a Q3, turning and going forwards. I’m still mastering going backwards! I have know people step on and after a short ride with someone helping them keep their balance, they are stable, in control and able to Airwheel unassisted. The key to riding any Airwheel is to stay relaxed and start simple. Ideally have someone or something to hold onto until you get going. The Q3 does come with a safety strap you can tie through the handle, which gives you something to hold onto and makes learning much easier. Once you get the hang of it, it is great fun! When you first start learning your shins will most probably start to get a bit sore, as every time you fall off, they take the impact. Riding now doesn’t cause any discomfort, but until you get the hang of Airwheeling, be prepared for shin pain! What Makes The Q3 Different? 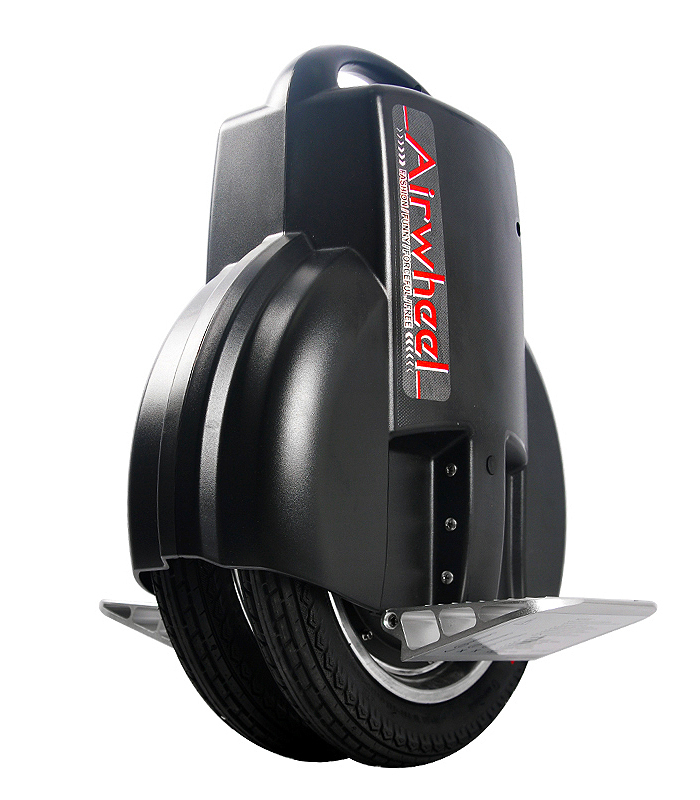 Airwheel make four key ranges: the X Series, one wheel Airwheel’s; the Q Series, two wheel Airwheels; the S Series, a Segway style transporter; and the Airboard, a two wheel skateboard/Airwheel mash-up. Airwheel models across all the series have the same top speed of 18km per hour (just over 11mph) and the limiter kicks in at around 12km per hour (8.5mph) on all models too. All models also have the same advisory weight limit of 120kg (19 stone). Q Series Airwheels (of which the Q3 is one) have stronger motors than most of the X Series models. They also all have two wheels as opposed to one, which helps with stability and balance, but does make (tighter) turning more challenging. The Q3 differs from other Q Series models mainly on battery life. It’s 28 mile potential range dwarfs that of all other Airwheels; with the exception of the S3 transporter. 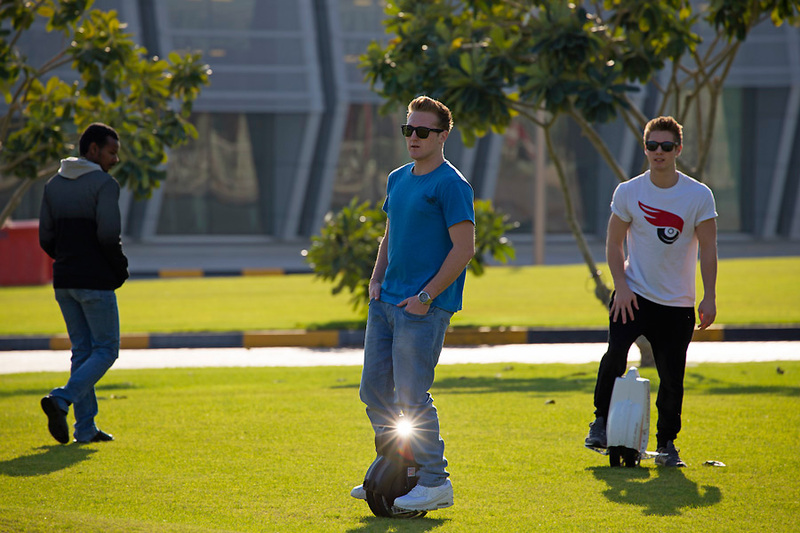 The Airwheel Q3 is one of the most versatile of the Airwheel range. The instruction manual (which is very small and to the point) suggests that it can safely climb at angles of up to 15-18°, however I have ridden up slopes of well over 30° with no problem. Some of the less powerful models struggle with steeper inclines, but even large hills prove no problem for the Q3. Going uphill uses significantly more battery, however on the plus side, when going downhill, the unit uses little power and can even use the slope to partially recharge the battery! The Airwheel was clearly designed for flat, level, tarmacked surfaces, however it also performs surprisingly well on grass. For more experienced riders, it is also possible to ride on gravel and through muddy fields. More uneven surfaces do drain the battery faster, however you can still get a very healthy life from the Q3 on places like cycle paths and bridleways. I think pretty much anywhere you could manage to ride a bike, you can use a Q3. The Q3 handles bumping down small steps and curbs surprisingly well. I have also tried jumping up curbs with some success. Weighing around 13kg is is quite heavy to jump the unit off the ground using just your legs, however I can now jump up medium sized curbs with no problem – most of the time. I always use a dropped curb if I can – it’s less tiresome! I’ve been quite interested in what the legalities surrounding the Airwheel are. In the UK it doesn’t yet have it’s own specific law – and it may never have. I emailed Airwheel asking where I can legally ride my Q3 in the UK and they replied saying that it could be used on pavements but not on the road. Below is Airwheel’s reply. “In terms of the legalities of use, The UK separates vehicles and forms of transport into certain classifications or categories. Fortunately for the AirWheel, it does not suffer the same fate as the Segway in falling into the Road Vehicle category. This in turn means that it is treated similarly to a skateboard or a scooter. It can be used on pavements (not road use) or public areas. But if course the key thing we emphasise is respectful and careful use. I have asked a police officer their opinion, which was that they didn’t believe you could be handed an on the spot fine for using one, however if they saw you using on on public pavements – especially if they were busy – they would probably ask you to dismount it. I have never had any issues using mine, and I think the key is to respect other people, as ultimately I’m slightly more hazardous than if I were just walking. I didn’t have any specific ideas as to what I would be use an Airwheel for before I purchased it. It was really just a cool gadget that had the potential to make short journeys faster and more interesting. I sometimes use it to get around campus at University amongst other short journeys. I have no trouble carrying things (so long as they are easy to hold) and I have even Airwheeled holding 25kg of potatoes for about quarter of a mile! I have found that simply owning an Airwheel has got me out and about more often, as I will now find any old excuse to go out for a ride. Ultimately the primary reason I own a Q3 is fun. As I mentioned earlier, Airwheels can be used to perform stunts and things like jumping up and down levels. You may think that it would be easier to perform stunts on the X Series models, which are smaller and lighter, however as gymnast Damien Walters and friends demonstrate, the Q3 also has a stunt alter ego! Another potential use for the the Q3 is filming. The Q3 can provide a remarkably smooth ride and it is virtually silent, making it ideal for shooting footage. If you want a more in-depth review of using the Airwheel for filming, check out this review by Tom Antos. The Airwheel Q3 could also be quite useful for commuters. If you have to walk some distance to work from your car, or the train/bus station etc., an Airwheel could become a useful time saver. When out and about a few weeks ago I was approached by someone interested in what I was riding, as they worked in exhibition centres, which involved a huge amount of walking. The Q3’s huge battery life would make it ideal for zipping between arenas. I have also thought that Airwheels would be quite good for personal trainers. Most people jog at a pace of around 6-7mph, so if you wanted to ride alongside someone and give them encouragement, an Airwheel would be a good option! These uses are by no means exhaustive, if you have an idea of what you would like to use an Airwheel but are not sure if it you can, feel free to get in touch! I have been asked whether Airwheeling is a lazy alternative to walking. I don’t believe it is. I think sometimes it is good to walk, but a lot of the time Airwheeling is faster and more convenient. I don’t buy the argument that standing on an Airwheel and letting it whiz you from A to B is lazy for two reasons. Firstly you don’t stand on an Airwheel, you balance – balancing being a skill involving muscles all over your body. As a reasonably experienced rider it doesn’t take much effort for me to balance, but I’m still not standing – and I do have the occasional wobble! Secondly it doesn’t whiz you around, you have to move your body to get it to move and turn. Furthermore on some of the longer journeys I’ve undertaken on my Airwheel (I’m thinking 45 minutes plus) I have really felt my calves and core working. In fact one of the reasons I purchased an Airwheel was to help me improve my core stability and balance! The book hasn’t disappear because of the Kindle and similarly people won’t stop walking because of Airwheels. I have made a few modifications to the Q3. 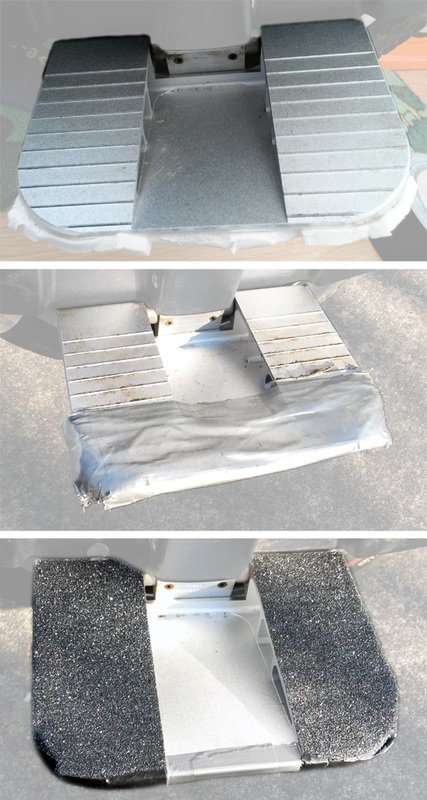 After slightly scuffing the unit on my first test run, I added some foam to the casing and the underside of the pedals. I’ve now taped over the foam with black gaffer tape (originally grey, but it stood out a bit too much!) to add a further layer of protection. I don’t really need this extra protection anymore, however it is good to know that if I do fall off, I’m not going to scuff the casing. The Airwheel itself seems to be pretty indestructible, so the tape and foam is purely to prevent scuffs and scratches on the casing. 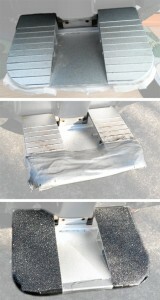 I’ve also added some grip tape (the same stuff you use on skateboards) to the top of the pedals. To stop the foam that I had stuck to the underside of the pedals from coming off, I had gaffer taped over the pedals which meant I lost some grip. The normal pedals are okay, but with the additional grip tape it makes riding much easier – maybe something for Airwheel to add to future models. Like it or not, when riding an Airwheel you do attract some attention. Almost everyone is very polite and kind and I’ve yet to have anyone get angry at me for using my Q3. Here is some of the most common feedback I get. The Airwheel Q3 isn’t perfect and it could be improved in many ways. The thing which annoys me the most is the beeping. When the unit falls over 45° it beeps – this is usually to let you know you’ve fallen off, just in case you needed telling – and won’t stop until you turn it off. It also beeps when you go over 8mph to let you know that you are getting close to the 11/12mph limit. At this stage it will also slowly start to tip you backwards, to prevent you from leaning forwards (thus accelerating) more. This beeping means that on long journeys you have a trade off: restrict your travel speed to 8mph, or travel faster with beeping all the way! I personally feel the limiter is set too low and would like to see it raised to around 9.5/10mph – much closer to the 11/12mph limit. At 13kg the Airwheel Q3 weighs about the same as four newborn babies – or 13 kilogram bags of sugar. This does make it a little impractical to carry. Airwheel do make a rucksack which can house the Q3, which does make it relatively easy to transport. The rucksack appears to have been designed to carry smaller models, as fitting the Q3 inside is a squeeze and does leave some of the straps straining under the weight. My conclusion is, if you can, ride it! Considering how technologically advanced the Airwheel Q3 is, it makes surprisingly little noise. Between 1 and 2mph it is virtually silent, it is loudest between 3 and 5mph, but once you accelerate past this, is quietens down again; until you hit the beeping limiter at just over 8mph. It’s only very recently that noise has become a niggle for me, I was out with someone who was walking and realised that in trying to keep to their pace, the Airwheel made more noise than it did than were I going faster or slower. Unless you are listening out for it, it won’t bother you. Expecting such a clever device to be completely silent might be asking a bit too much! The instructions are reasonably simple and appear to have been translated – not always very well – but they are readable. It would have been good to have a bigger manual with more tips and instructions; for such a technical device, clarity and in-depth information would have been appreciated. I’ve found the after-care support from Airwheel Direct has filled in any knowledge gaps that I’ve come across, however I can appreciate some people may like a more substantial manual to read through first. For the majority of people price is usually the ultimate crunch point. If you have a fantastic machine but nobody can afford it, then you aren’t going to sell any; which is one of the reasons the Segway never quite took off. In the UK an entry level Segway currently costs in excess of £5,500, which is just a few hundred pounds off the cost of a DACIA Sandero. Five seater car or Segway? For many people a Segway is just too costly. So how much does an Airwheel cost? Here in the UK, the cheapest Airwheel costs just over £500 – equivalent to around $750 USD. That’s for a one wheeler X3 which has a range of about 4-6 miles. If you want to purchase a Q3 (pretty much the top of the range) you need to fork out around £800. So you could purchase about 7 Airwheel Q3’s for the same price as the cheapest model of Segway. Were the Q3 priced around £400 I wouldn’t hesitate recommending it to anyone. The fact that it costs £800 does however makes the decision a little more difficult. Ultimately I’m pleased with my purchase and whilst I would have rather paid £400 I do think the Q3 is worth what it cost me. I use it so often, it is so practical and it makes everyday tasks like nipping down to the shops (for 25kg of potatoes!) so much more fun. I wouldn’t be without it. Something to bear in mind is that whilst £800 may seem like a lot, it is less than what a £34 mobile phone contract would cost you over the course of two years. Maybe there’s an idea for Airwheel, offer 24 month finance plans! When I got in touch with Airwheel Direct (who I purchased my Airwheel from) letting them know that I was going to write a review, they gave me an exclusive Airwheel discount code for 5% off all models; simply enter TB5 at their checkout. They also offer Airwheel experience rides – something it’s worth doing if you are thinking of buying one. After so many miles, just like a bike, you will need to replace the tyres and inter tubes on the Q3. Having two tyres makes it slightly more expensive in that respect, as when the tires do wear out, you have double the cost – and a higher chance of getting a puncture in the meantime. The cost of replacing both tyres and inner tubes on the Q3 is an eye watering £160 – double that of X Series models. That said,most Airwheel retailers, like the guys at Airwheel Direct offer discounts to existing Airwheel customers on tyres and inner tubes. Luckily I’ve not had to replace my tyres yet, however in order to do so you need to take the entire unit apart – unscrewing the bolts on each side until the unit splits in two. It describes how to replace a tyre in the instruction manual, so I’m sure it’s not too difficult, however I’m still not looking forward to having to change mine! Ultimately the Airwheel Q3 is a fantastic product. Its powerful motor and strong battery mean you can travel far on a variety of terrains. New riders can learn to ride the Q3 without much practice and it offers convenience and challenges for advanced riders too. If you want to get somewhere fast, the constant (speed limiter) beeping can be very annoying! The cost of the Q3 is its main drawback, you have to be sure that you would use it, before you buy one. I’ll end on a neat little summary that one of my friends came up with. 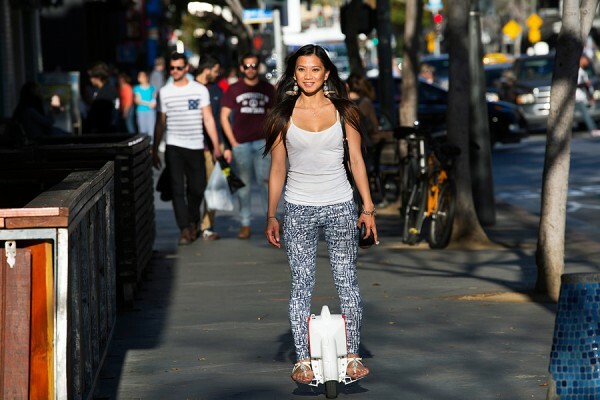 The Airwheel Q3: miles of smiles! UPDATE: Having owned my Airwheel Q3 for nearly a year now, I’m still very satisfied with my purchase. I still ride it several times a week and it has been useful on so many occasions. Having ridden many of the other Airwheel models – including the hoverboard style Airboard – The Airwheel Q3 is still my favourite model. I feel it’s the most practical of all the Airwheel models, and were I writing the review today, I would rate the Airwheel Q3 4.5 stars. Hands up, who’s ever heard of an Airwheel? Okay a few of you at the back… oh no you’re just scratching your heads. Okay, take a look at this. I am of course referring to the ‘gadget’ not the lady who is standing upon it. That device (or ‘gadget’ as I just referred to it) is called an Airwheel. That’s how I describe mine to people now. Self-balancing motorised unicycle was a bit of a mouthful and it often gave people who hadn’t seen one the wrong idea as to what I was riding – I’m not training to join a circus! To be precise, the lady in the above picture is standing (well, strictly speaking she is balancing) on an Airwheel X5; a 10kg model with a 500 watt motor and a 14 inch tyre. Airwheel being the brand, X5 the model. I’ve recently bought myself an Airwheel and as a technology blogger I feel it’s my duty to put it through it’s paces, and then write a review on my findings. That’s not this post though, the review is coming out next Monday. Today my plan is to break you in gently to the Airwheel concept and technology. As I’ve already mentioned, Airwheel is the brand and there are many different models of Airwheel. 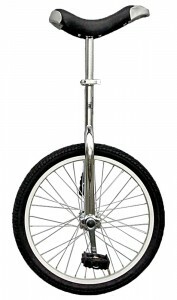 They mainly make devices like the one in the picture above (right at the top, not the one of the traditional unicycle!) but they also make a Segway style rover and a skateboard type transporter – called the Airboard. The model I have bought is a two wheel Airwheel Q3 – also known as the Mars Rover. Strictly speaking having two wheels means it’s not a unicycle – so it’s a bicycle, or a ducycle, but there isn’t any cycling involved so… I don’t really know what it is! How Does An Airwheel Work? You may be wondering, what is the technology behind the Airwheel? Well it’s actually reasonably simple. The computer chip (which is tucked away safe from water and dust in a compartment inside the unit) uses information it gets from its sensors to keep the device level by moving the wheel(s). If the user puts pressure on the unit in a forwards direction (by leaning forwards and pushing their toes towards the floor) the device moves forwards. To slow down they then push down with their heals, which reduces the speed and can even enable you to reverse! In one word: very! You can travel forwards and backwards on them at up to around 11/12mph. Once you get the hang of it you can travel over grass, gravel and mud, turn in very tight spaces and jump up and down steps and curbs! Want proof? Here is a (bit of a daft) video of me, pushing my Q3 to its limits. You may be shouting “don’t break it!” at your screen, but don’t worry, it’s pretty durable. I’ve fallen off mine whilst testing the limits several times – no broken bones, yet! – and it still works; like new. As you may have been able to pick up from that video, I’ve covered mine in foam and then Gaffer taped it on. The only reason I have done this is to protect the casing. When I first took it out I fell off once or twice and as the unit fell over it scuffed itself a little. The foam now takes the impact instead – although I seldom fall off nowadays. That’s it for this article. I will be doing a full review of my experience of the Airwheel Q3 next week and will be deciding is it any good, and if so, is it worth what it costs. In the meantime, if you are interested in finding out more about Airwheel and the different models, check out Airwheel Direct. I’ve been given an exclusive discount code for Technology Bloggers, if you enter TB5 at the checkout it will get you 5% off all models.